There are 5,000 people on the Croydon council housing list, many of them officially homeless. This is only likely to increase as people are being forced out of Lambeth and other neighbouring boroughs due to the increasing cost of housing. Many have been put in temporary accommodation. Across Britain, around two million families are stuck on council and housing association waiting lists, with the Tories spitefully striking off 113,000 people by changing the way in which people qualify. House prices in London are continuing to spiral out of control. According to recent figures from the Land Registry, prices in Croydon have risen by 17% over the last year (against a London average of 11%). This is caused by a shortage of housing in the capital, the activities of ‘buy to let’ landlords and the Government’s fundamentally misconceived Funding for Lending scheme which fuels another speculative bubble. The average property value in Croydon is now £324,000. According to ONS statistics, the average wage in Croydon is £24,336. As real wages have fallen for most people since the start of the recession, house prices in Croydon are now less affordable, compared to earnings, than ever before. It’s usually considered that a reasonable level for house prices is about three times that of earnings. But, for the first time, we are seeing average London house price which are thirteen times the average wage. People are being forced to take on absurd levels of debt to buy a home. Mr Stevenson said, “Clearly, this isn’t sustainable. At some point the bubble will burst. Local politicians are failing to meet the housing needs of those least able to defend themselves: the poor, the vulnerable and the socially excluded. Meanwhile the number of new houses being built is falling to an all-time low. The only significant building projects that get the green light are those that promise yet more luxury apartments in an attempt to lure high earners away from Central London. The supply of social housing in Croydon is of course, woefully inadequate. Years of neglect by the local Tory council, along with central New Labour and Tory Government housing policies, has left Croydon with a smaller housing stock then almost any other London boroughs. Even the Council’s own Housing Strategy admits that Croydon is ill-equipped to meet housing need. An entire generation of people in Croydon are being systematically denied their right to decent affordable housing. The communist party is absolutely clear. Having a decent place to live should be a basic human right. Labour has failed to take this issue seriously. Their policy on house building is opaque. Is it 200,000 or 250,000. Is that per year or just by 2020? Are those affordable homes or just more sky scrapers built to provide luxury apartments? How exactly is this meant to be achieved if not through a programme of council house building? In fact this policy commitment seems to be based on an expectation that the housing and construction market will itself magically deliver a solution. We need, as a matter of urgency, to campaign for a significant council house building programme, an end to the bedroom tax, an end to council house sales, compulsory requisitioning of long term empty properties and rent controls in the private sector. Our immediate priority has to be to tackle private landlords. Rather than vague commitments to cap rents at CPI, I want to see an immediate rental cap of 50 per cent of average local earnings, driving it down until it’s 25 per cent. Communists in Croydon published a pamphlet in 2014 on the growing housing crisis in the borough, Decent Homes For All: End Croydon’s Housing Crisis Now! This publication seeks to explain the why and how of Croydon’s housing crisis. Copies are available on this blogsite or by contacting us direct. 2. Ben Stevenson is 30 years old and National Organiser of the Communist Party. Since moving to Croydon from his native Birmingham in 2005, he has been heavily involved in local labour movement politics through the Croydon Save Our Schools Campaign, the campaign against the Beddington Lane Incinerator and the Croydon Trades Union Council’s Executive Committee. He stood as a Communist Party candidate in the 2012 Croydon North by-election and the 2014 Bensham Manor local election. 3. The Communist Party was founded in 1920 and is part of an international movement involving millions of people in more than 100 countries across the globe. This year marks the 85th anniversary of the Morning Star. The paper first came out on 1 January 1930 under the title, the Daily Worker. It changed its name to the Morning Star in 1966. The paper is the voice of organised labour. It’s the only paper that reports on the industrial and political issues that matter to ordinary people. And it will play a crucial role in this general election year as the political debate sharpens and we fight to get rid of the Con-Dems in May. Croydon – Heart of the World Revolution? 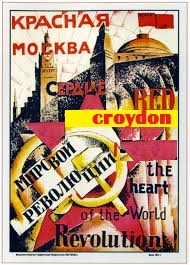 Why have I modified the classic poster Moscow – Heart of the World Revolution this week to substitute Croydon for Moscow? Well, the skyline depicted in the original does look a bit like Croydon’s, does it not? More significant, however, there were two events of some significance in our town over the weekend. On Saturday the Croydon Assembly, sponsored by Croydon TUC, held a day of speeches, workshops and discussions at Ruskin House. The day was opened by John McDonnell MP and Philipa Harvey, Vice Chair of the NUT. At lunch time it was addressed by Mark Serwotka, General Secretary of the PCS union. Thus at one meeting Croydon hosted the leading socialist parliamentarian, a rising star in the NUT and the country’s most prominent left wing trade unionist. In between there were a series of dynamic workshops on topics as diverse as how to save the NHS, democracy and trade union rights, education, climate change and welfare cuts. Most of these workshops agreed to meet again in the New Year to press on the political parties standing in Croydon at the forthcoming General Election the need for progressive reform and an end to creeping privatisation, cuts and austerity. If they want our support and our votes, they can no longer rely on the old argument Vote for us, we are the least bad option. The other big event in Croydon over the weekend was the 53rd Congress of the Communist Party, held at friends Meeting House on Saturday and reverting to Ruskin House on Sunday. The keynote speech by General Secretary Rob Griffiths took a similar line. Mr Griffiths said that “if Labour is serious about winning the General Election” it must commit to “taking the railways, Royal Mail, gas, water and electricity back into public ownership.” Resolutions passed by Congress included commitment to step up campaigns to save the NHS and oppose discriminatory policies against the disabled. Perhaps Croydon – Heart of the World Revolution is a little over the top, but it was a moment of optimism and hope in Croydon last weekend. Revolution? Not yet perhaps, but the fightback against the rich and powerful is just beginning. Earlier this month, Bernie Ecclestone was able to terminate the prosecution for bribery against him in a German court by agreeing to pay £60 million. His lawyers insisted, of course, that this payment was not an admission of guilt. £60 million is a lot of money to pay when you are innocent. It is, however, considerably less than another out-of-court settlement this month: that by Bank of America following a charge by the US Justice Department of “misconduct in the production of mortgage-backed securities”. This was for $16.65 billion. Like the settlement of the German court case, it is intended to ‘wipe the slate clean’ and forestall any further prosecutions or claims for damages. As in the Ecclestone settlement, there was no admission of guilt. We will probably never know whether Bernie Ecclestone’s payment of £60 million represented value for money for him. As he risked a jail term if the prosecution was successful, perhaps, it did. After all, he is not a young man and he might have been required to serve his sentence in one of our grubby, under-funded and over-crowded prisons rather than in a more humane German lockup. We do know, however, that Bank of America’s settlement of $16.65 billion represented a real bargain for them. According to the US Government Accountability Office, the 2008 Financial Crisis triggered by the mortgage backed securities scam cost the US economy alone $22 trillion. The cost to the world economy must be a multiple of this huge sum. Crises are endemic in capitalism. While Marxists have a good understanding of this phenomenon, capitalists and their advisers tend to ignore it until it happens. Even if they are interested in anything beyond mere personal and family accumulation, the economists to whom they listen fail to see beneath the surface of the economy and mistakenly conclude that the system can be managed and boom and bust avoided. The snake oil remedy they invariably peddle is ‘more competition’ as, for example, did John Vickers in his report on UK banking. It would be more honest to admit that capitalism is a casino for the rich who must get out of the market before the bubble bursts. If the Bank of America had not decided to peddle worthless mortgage-backed securities, another trigger would eventually have kicked off the recession. Thus the real remedy is for ordinary working people to own the banks and all the other major undertakings in the economy, not the other way round. Until that day dawns, however, let’s kick up a fuss about the inadequacy of the fines and penalties, such as they are, on those banks whose reckless behaviour triggered the financial crisis. Croydon Communists’ Rallying Cry for the Local Elections: Let’s Fight for a People’s Britain Not a Bankers’ Britain! Croydon Communists stepped up their campaign in the May 2014 local elections. Members were out yesterday leafleting in the three wards where we are standing candidates in the May 2014 local elections: Bensham Manor, Selhurst and Broad Green. Croydon Communists see the election as a real opportunity to take the fight to the Con-Dem Government and explain to local people that there is a future worth fighting for based on a genuine socialist political and economic strategy. The Government continues to try to con people into thinking that they offer the only way out of the economic crisis. But ordinary people know when they are being sold a pup. Real wages remain significantly lower than they were before the recession hit; pensioners and benefit claimants have seen a significant reduction in disposable income; and the NHS, education, social housing and other public services are under a sustained assault by a government determined to turn the clock back to the social conditions of the 19th Century. It’s time we put people before profit – and fought for a people’s Britain rather than a bankers’ Britain. •	A tight cap on councillors’ allowances and expenses. 2. Ben Stevenson is 29 years old and National Secretary of the Communist Party. Since moving to Croydon from his native Birmingham in 2005, he has been heavily involved in local labour movement politics through the Croydon Save Our Schools Campaign, the campaign against the Beddington Lane Incinerator and the Croydon Trades Union Council’s Executive Committee. He stood as a Communist Party candidate in the 2012 Croydon North by-election. 3. John Eden is the Communist Party candidate for Selhurst. He is 64 years old and a carpenter and joiner. He is a member of Croydon Trades Union Council’s Executive Committee and has lived in Selhurst for 27 years. 4. Dr Peter Latham is the Communist Party candidate for Broad Green. A former lecturer, he has lived in the area for many years. He is the author of ‘The State and Local Government: Towards a new basis for local democracy and the defeat of big business control’ and a longstanding member of Croydon Trades Union Council’s Executive Committee. 5. Croydon Communists recently published a well-received pamphlet on housing issues in the borough, ‘Decent Homes for All – End Croydon’s Housing Crisis Now’, which is available on the website or by contacting us direct. 6. The Communist Party was founded in 1920 and is part of an international movement involving millions of people in more than 100 countries across the globe. Please consider my letter below for publication in next Friday’s issue of the paper. Lib Dem local election candidate John Jenkins, according to your report on 4 April, was furious that he would be speaking at Croydon Radio’s hustings programme on 6 April alongside Communist and National Front candidates he describes as the “lunatic fringe”. In fact Ben Stevenson, Croydon Communist candidate for Bensham Manor ward, dropped out of the show immediately we learnt that a National Front candidate would be appearing. This follows our ‘no platform to racists or fascists’ policy, which is a matter of principle held not only by communists but also by trade unions and vast sections of the labour and progressive movement. We therefore applaud the decision by Andrew Pelling – who is also a Labour local election candidate – to resign from Croydon Radio because the NF were given a platform at the station’s hustings programme on 6 April. John Jenkins is also politically illiterate when he equates communists with fascists because fascism is the last resort of a capitalist state in crisis. Moreover, the very first people Hitler sent to the gas chambers were the German communists as shown by Pastor Martin Niemoller’s famous poem: ‘First they came for the communists and I did not speak out because I was not a Communist… Then they came for the Socialists…the trade unionists…the Jews… Then they came for me and there was no one left to speak out for me’. Capitalism is again in crisis today and this is why the Communist Party of Britain is part of the No2EU alliance (set up by the late Bob Crow) whose manifesto will go to all households urging voters on 22 May to support a non-racist socialist exit from the European Union with its austerity policies. · ending tax dodging by the super-rich and big business (revenue £70 billion a year). It is reported this week that if the Co-op Board does not accept the proposals from Lord Myners to ‘reform’ their structure to make it look more acceptable to ‘the City’, the Co-op’s principal lenders, Barclays, Lloyds Bank and Royal Bank of Scotland will flex their muscles and insist on the ‘reforms’ or call in their debts. Hang on a moment. Barclays? Lloyds? RBS? Lord Myners??? Has the world gone completely mad? The capitalist world is, of course, full of such contradictions, but in this case the lunatics appear to have taken over the asylum! Lord Myners originally attracted modest public attention as a financial journalist on the Daily Torygraph before rising to prominence as the Chairman of Marks and Spencer, where his ‘reforms’ clearly failed to reverse the painful, protracted decline of this once dominant and celebrated high street retailer. In 2008, he was appointed by Gordon Brown Financial Secretary to the Treasury where he oversaw the shawing up of …Barclays, Lloyds and RBS. The consequences of these bailouts resulted in the recession and the coalition government’s continuing efforts, with Labour’s endorsement, to make ordinary working people pay for the resulting economic crisis. The once in a lifetime opportunity to rein in the banks and make them serve the interests of their customers (rather than fleecing them) and the nation (by financing real businesses, not speculators) was thrown away. In the specific case of RBS, Myner’s judgment has proved particularly deficient. The parliamentary Treasury Committee reported in 2009 that “The RBS Board had shown itself to be incompetent in the management of the bank, steering it towards catastrophe… We suspect that Lord Myners’ City background, and naiveté as to the public perception of these matters, may have led him to place too much trust in an RBS Board that he himself described to us as “distinguished”. Such are the individuals and businesses that now seek to dilute the democratic structures of the Co-op. The Communist Party in Croydon wishes the Co-op well in its struggle to keep its independence and we give our full support to our elected representatives from Croydon in this fight. I have just been on a short break down to Arundel in West Sussex via the Surrey Hills which is classified as an “Area of Outstanding Natural Beauty” right on the doorstep of Croydon, it is in my opinion some of the best English countryside you will ever find, yet I wonder how many Croydonians realise this or have been there. Seeing the sign approaching “Surrey Hills” it reminded me of “Suffragettes” and “California” a connection I shall explain. Some five years ago, while working at Ruskin House in Croydon, I use to have my lunch and often my evening meal in the “Skylark” the Wetherspoon Pub in South End, one part of the Pub is lined with bookshelves, containing many old books, one of the oldest I found had an inscription inside from a Mother to her Daughter, it was a Christmas present and dated 1845. One of the books I flicked through, the “Fowler” by Beatice Harraden published in 1899, had a reference in the novel to a “Grantham School for Girls”, coming from Grantham myself, I did not know if this was a fictional or real school that may have existed once in my hometown, I could find no reference to it in Google. The Grantham and Kesteven Girls High School is not fictional “Famous” for having my Auntie as a pupil and equally famous for having the future and imfamous Prime Minister Maggie Thatcher (Nee Roberts) as a pupil. 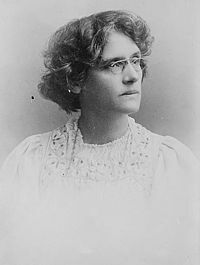 Beatrice Harraden author of “The Fowler” I found out had been quite a famous suffragette, mainly as a contributor to many of their journals, and wrote novels, with their cause as its theme. her most famous book of 1893 is “Ships that pass in the Night” which ran through many editions, I picked one up while on holiday, in Hay on Wye in 2007, a twentieth edition published in 1900. Croydon had a very strong women’s movement in the ninetieth and early twentieth century by all accounts, as there were three separate movements, in Croydon in 1912, each having offices, two were in George Street and one was in the area of the present Green Dragon pub. Now the maybe not so “tenuous” link between the “Surrey Hills” and “California”. One of Harraden’s short stories that I read called ” Hilda Stafford and The Remittance Man (Two Californian Stories) (1897) the author had spent sometime in America, the story might be part about herself or someone she knew. In the latter part of the ninetieth century as the story tells, some young Englishmen junior clerks in the City of London and similar types, were avid readers of Wild West novels, and dreamt of the life of a Cattle Rancher instead of the nine till five life of a clerk,commuting into the City from places like Croydon and it seemed quite a few turned this dream into reality, the novel goes on to show that the dream for most becomes a nightmare. The young men had answered ads in national papers of land for sale in Southern California, each had bought themselves many acres of land which turned out to be very barren, most of them failed to make it work,some returned to England, some even died in the attempt, like the character in the novel, who had brought his fiancé to share the life, she absolutely hated it, it was a landscape to her that seemed to be nothing but dust and rocks, dried out river beds in the summer and flash floods in the winter, it was one of these floods that destroyed the ranch and lead to the death of her fiance, she remarked before his death that she longed to return to England, and at the weekends walk again in the “Surrey Hills” she got her wish.